(Translated from Italian) Back is David Newbould, although ‘only’ for an EP with four songs for just over fifteen minutes, after the excellent “Tennessee” which we had occupied long ago. Despite the brevity of the work it is right to point this out to the expressive strength, inspiration and skill of Canadian-born musician, but a long living in the States (including Austin, New York and Nashville) confirming excellent run of form but that, due to increasingly tight budgets for artists that it self, takes the form of a reduced form. 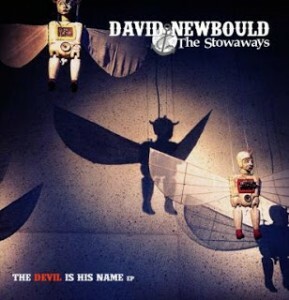 David Newbould deserves to be able to make a record at ‘full-time’ but for now we can content ourselves with these wonderful songs, from the powerful and compelling “The Devil Is His Name” characterized by a frenzied fiddle in the hands of Peter Hyrka. A roots of large rock socket and effectiveness. “Love You Like I Don’t Know How” in contrast, is a ballad from folk flavor that shows its more reflective and intimate side with a melody that conquers after a few notes, “Standing At The Crossroads Too Long” returns to most electric atmospheres while maintaining the form of ballad, really excellent with a guitar interweaving of excellent caliber of Andrew Sovine and the same Newbould. To close this (too) short EP is “Clam Bake City”, another remarkable acoustic composition supported by a soft carpet percussive (Joe Dorn behind the drums) as they occur arpeggios acoustic guitar and electric embellishments in the background create suggestions bewitch. A disc and a musician to consider waiting for his album ‘full length’.